HERBERT HOOVER (1874-1964). Hoover was the Thirty-First President. a) TLS. 2pg. 8 '12" x II". 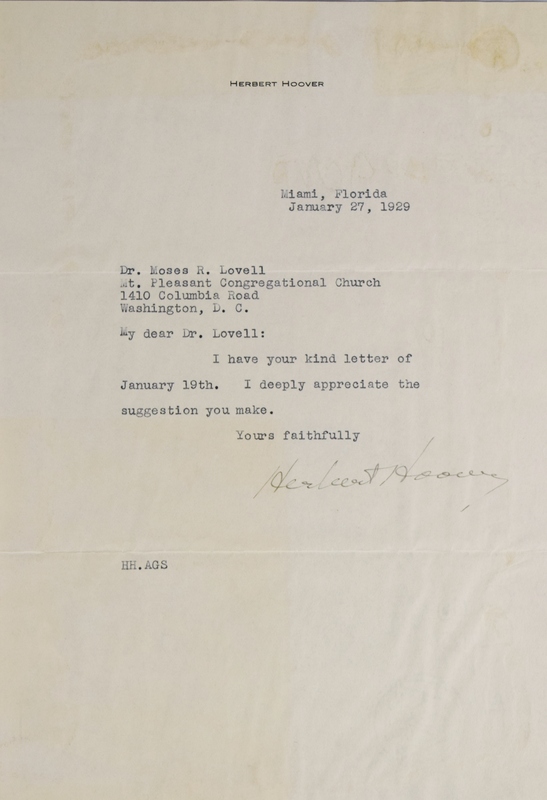 January 19, 1929. Washington, DC. 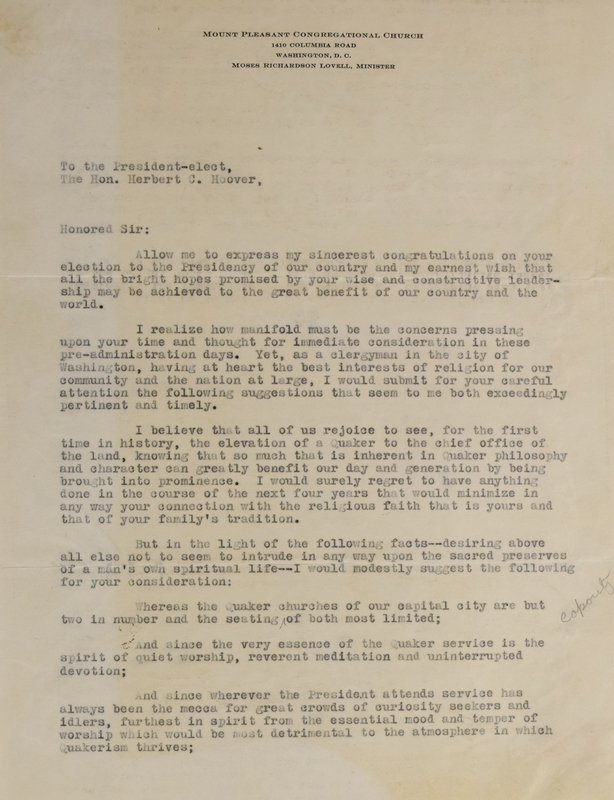 A typed letter signed "Moses R. Lovell" giving advice on to the recently elected President Hoover, who was the first Quaker President, on how to use his faith in his position. 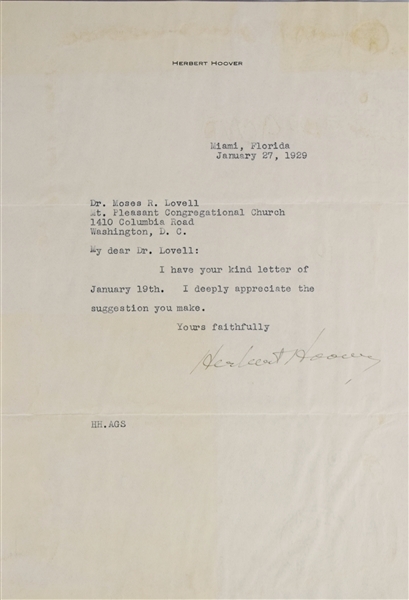 Lovell was the minister of the Mount Pleasant Congregational Church in Washington, D.C. 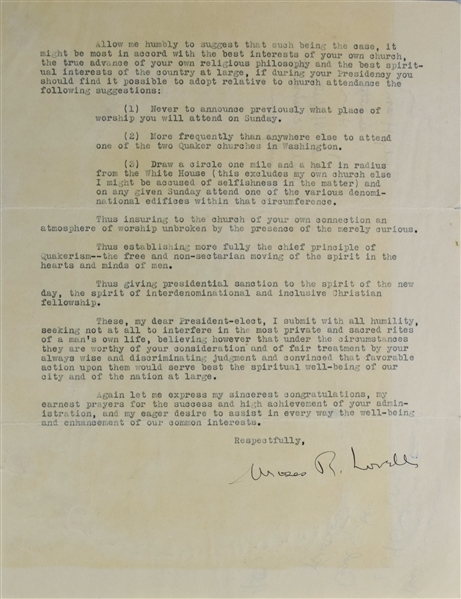 In part: "I believe that all of us rejoice to see, for the first time in history, the elevation of a Quaker to the chief office of the land, knowing that so much that is inherent in Quaker philosophy and character can greatly benefit our day and generation by being done in the course of the next four years that would minimize in any way your connection with the religious faith that is yours and that of your family's tradition. But in the light of the following facts-desiring above all else not to seem to intrude in any way upon the sacred preserve of a man's own spiritual life - I would modestly suggest the following for your consideration: ... it might be most in accord with the best interests of your own church, the true advance of your own religious philosophy and the best spiritual interests of the country at the large, if during your Presidency you should find it possible to adopt relative to church attendance the following suggestions: (1) Never to announce previously what place of worship you will attend on Sunday. (1) More frequently than anywhere else to attend one of the two Quaker churches in Washington. (3) Draw a circle one mile and a half in radius from the White House (this excludes my own church else) might be accused of selfishness in the matter) and on any given Sunday attend one of the various denominational edifices within that circumference. Thus insuring to the church of your own connection an atmosphere of worship unbroken by the presence of the merely curious. Thus establishing more fully the chief principle of Quakerism-the free and non-sectarian moving of the spirit in the hearts and minds of men." The letter is in very good condition, with light toning. b) TLS. lpg. 7 v.." x 10 '12". January 27, 1929. Miami, Florida. 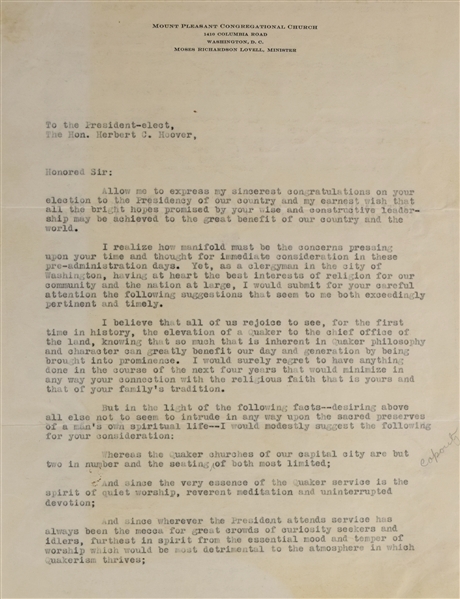 A typed letter signed "Herbert Hoover" as President-elect responding to the aforementioned letter: "I have your kind letter of January 19th. I deeply appreciate the suggestion you make." 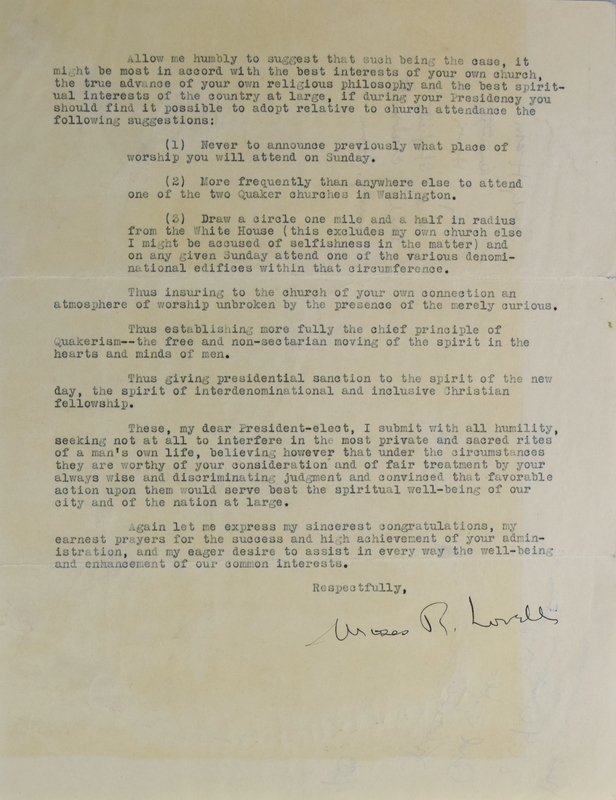 Written on Hoover's personal letterhead, this letter is in very good condition with mounting remnants on the verso.